— This commentary was broadcast on WAMC Northeast Report, January 29, 2019. I have no inside knowledge of this case but, unfortunately, it’s part of a pattern. Police claim that a Black man was charging them when a video shows that the guy was running away with his back turned. Or the police acknowledge that he was running away but claim to be scared because he was carrying something, maybe a knife or the keys to his apartment. One Black man after another has been shot in the back by police who claim to be scared that he would turn around, too scared of Black men to hold their fire when they have no reasonable fear of his behavior. — This commentary was broadcast on WAMC Northeast Report, January 15, 2019. Bargaining in public is a very different game. This negotiation isn’t about horse-trading; it’s about bringing the public along, not just liberal Democrats like me – there aren’t enough of us to win elections by ourselves, and the power is in the prediction of future elections – that’s what pushes both sides around. So, she took a very conciliatory position, a Republican position, a position both houses of Congress had supported, and said, in effect: Here’s a reasonable position, Mr. President; why don’t you be reasonable too? Of course, the big game down the road is impeachment. That will take a good deal of Republican support. The more unreasonable Nancy can make Donald look, the quicker he becomes a powerless lame duck. Then it will be time to talk about what I want. 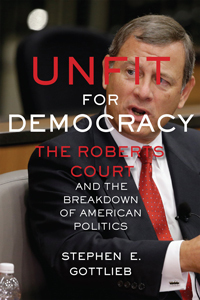 The Republican judiciary stopped the count and sent Al Gore, the Democratic candidate for president, back into private life, choosing instead to elect George Bush, and ultimately tearing both the American economy and the Middle East apart – decisions that did a great deal of damage to huge numbers of Americans. Democrats could simply refuse to appropriate funds for open judicial seats. The number of seats on all federal courts are just statutory and can be changed so long as the positions and salaries of sitting judges are not diminished. Seats on the Supreme Court have varied from five to ten; there’s nothing sacred about nine. Seats on the lower courts have varied even more. Can’t stand allowing Barack Obama to nominate the centrist Merrick Garland? Democrats need not give Donald the power to fill open positions with partisans whose main goal is to keep him and other Republicans in power. But leadership isn’t just about making good decisions; it’s about bringing the people along. A leader must have the humility to understand that they can’t produce shifts by snapping fingers. That’s one of the attributes for which I have always admired Franklin Roosevelt. I’m rooting for Nancy. — This commentary was broadcast on WAMC Northeast Report, January 7, 2018. You are currently browsing the Constitutionalism and Democracy blog archives for January, 2019.